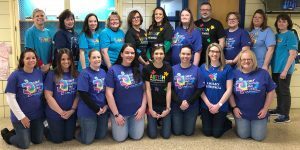 OSWEGO – Several Oswego City School District employees across all departments wore blue on April 2, in recognition of World Autism Day. Pictured are several Charles E. Riley Elementary School staff members showing off their blue and Autism awareness pride. As the district continuously seeks to be a community that accepts and appreciates diversity, its staff members remain committed to treat all with respect. Throughout the district, inclusivity is promoted, encouraged and a part of teaching and learning every day. Joined by the international communities around the world, the OCSD employees wore light blue in recognition of people living with autism. Autism-friendly events and educational activities are scheduled in the greater Oswego community throughout the month of April to help increase Autism-related understanding, acceptance and to foster worldwide support. Autism, or autism spectrum disorder, refers to a broad range of conditions characterized by challenges with social skills, repetitive behaviors, speech and nonverbal communication.